Ingredients: Water sufficient for processing, chicken, meat by-products, wheat gluten, turkey, starch, poultry giblets, salt, natural flavor, poultry by-products, sodium tripolyphosphate, added color, guar gum, potassium chloride, magnesium sulfate, taurine, choline chloride, dl-methionine, vitamin E supplement, zinc sulfate, ferrous sulfate, thiamine mononitrate, copper sulfate, manganese sulfate, pyridoxine hydrochloride, potassium iodide, vitamin D3 supplement, folic acid, menadione sodium bisulfite complex. Whiskas Choice Cuts With Turkey & Giblets In Gravy is formulated to meet the nutritional levels established by the AAFCO Cat Food Nutrient Profiles for adult cats and growing kittens. 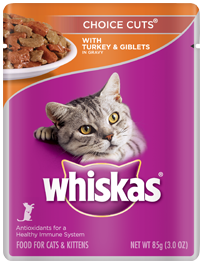 We'll begin this review of Whiskas Choice Cuts With Turkey & Giblets In Gravy with a detailed discussion of the ingredients. The fifth ingredient is turkey. Turkey is another excellent protein source. As with other raw meats, turkey contains a substantial amount of moisture and therefore the relative meat contribution of turkey is dramatically reduced after cooking. Because ingredients are listed in order of pre-cooked weight, the remaining ingredients in Whiskas Choice Cuts With Turkey & Giblets In Gravy are not as important as the first five ingredients. The next ingredient is poultry giblets. Poultry giblets includes the heart, liver, gizzards, and other internal organs of poultry. 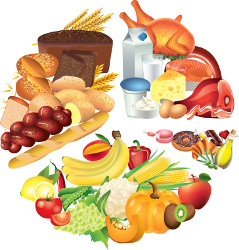 Organs are nutritiously dense ingredients which provide high quality protein and fat. However, this particular ingredient is considered an anonymous meat ingredient because the type of poultry is not specified. In order words, "named" giblets such as chicken giblets or turkey giblets are preferred over poultry giblets. Then we have salt. Salt is an important mineral for both humans and cats. Depending on the quantity of salt used (which we cannot determine), salt may or may not be a nutritious addition in the recipe. Moving on, we have natural flavor, which is used to enhance the flavor of the food. Moving on with this review, we have poultry by-products. By-products are defined by AAFCO as the "non-rendered, clean parts, other than meat, derived from slaughtered mammals." Thus, poultry by-products contain nearly all parts of poultry which are typically not consumed by humans. These parts include the liver, lung, spleen, kidney, stomach, blood, intestine, bone, etc. The official PawDiet rating for Whiskas Choice Cuts With Turkey & Giblets In Gravy is 3.5 out of 5.